A properly timed swing can take hours and hours of practice time on the range to groove your muscle memory. One of the keys to playing golf well is a properly-timed swing that makes solid contact with the ball at the point of impact. If your timing is poor, it feels as if you are rushing to hit the ball. With good timing, the feeling is just the opposite. Your body feels smooth and relaxed and there is a positive flow to your swing. Step up, get into your stance and address the ball. Before you start your swing, try to feel the weight of the club head. To accomplish this, loosen your grip and feel the weight of the club in your fingers. Feeling the weight of the club is the first step toward developing a smooth, well-timed swing. Pull the clubhead back in your takeaway, while still feeling the weight of the club. The movement should be smooth, not jerky or quick. As you take the club back with your arms, allow that movement to flow into the cocking of your wrist. Start your downswing. At this point, your arms and the club should form the shape of a "V"--with the club still vertical and the wrists still cocked, waiting to unload. Accelerate your hands and break your wrists as you reach the bottom half of your downswing. Shift your weight so that 70 percent of it is on the side of your body closest to the target. Swing through the ball. One of the major sources of weak hits is the thought that you should just hit the ball. Instead, swing through the ball so that there is acceleration at and through impact. 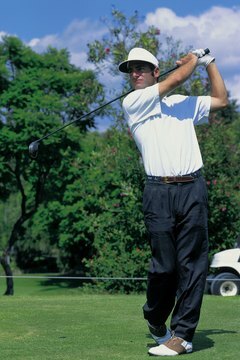 Open your hips and torso toward the target as you swing through the ball.